This tangle of wires was what I found in someones loft, all I had gone there to do was to get one socket working and add a new socket in a downstairs room, all the other sockets in the house were working fine.This was a converted bungalow with a bedroom in the loftspace and just a crawl space to get to the amps and cables. Typically the room where the socket wasn’t working was on the opposite side of the bungalow to the amps, however, there were some cables not connected to the amps that looked like they went off round the end of the craw space in the direction of the relevant bedroom, I thanked my luck as I connected them one by one into a spare outlet on the amp, getting ever more despondent as one after the other they failed to work. So that idea was exhausted, I knew there would be a cable laying in the loft somewhere that went to that room and the only way to find it was to crawl right around the crawl space to the other side of the bungalow, not easy as there was plumbing everywhere and more electric cables than I had ever seen in a bungalow’s loft. 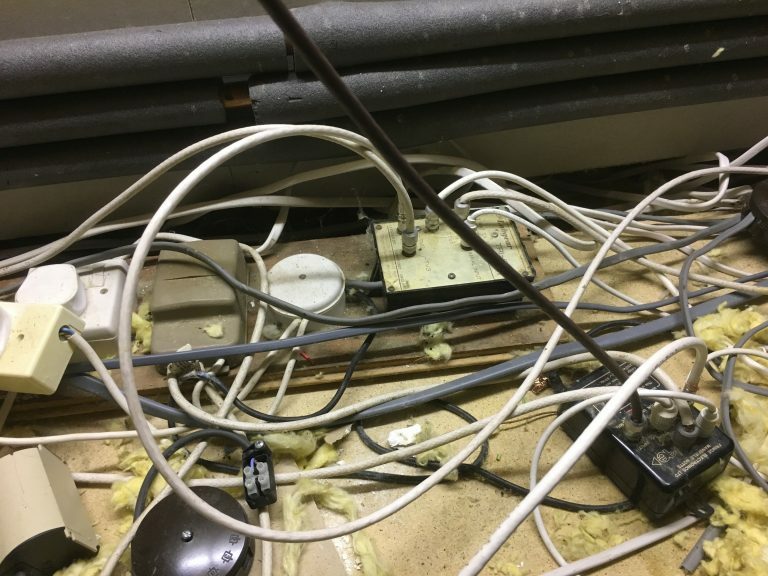 Eventually I got myself over there and found a roll of cable hanging from a beam, so there it was, I dragged it back around to the amps and connected up…bingo! Compared to that running a cable to a new socket was kids play. The amps that were there were a bit of a bodge, there was one three output amp feeding into another three output amp, the other box was a masthead power supply that didn’t seem to be doing anything, so while I was there I took the opportunity to replace the old amps with a single new one, at least that tidied the aerial side of things up a bit!